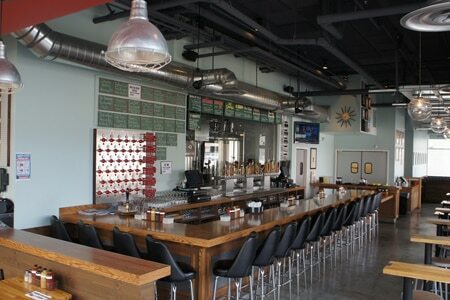 Relaxed downtown Long Beach venue serves up rare craft beers, haute bar food and gourmet barbecue. : It can be hard to find really good barbecue in the greater Los Angeles area, and that's one of the reasons why this downtown Long Beach joint is worth noting. Yet it's far from the only reason. This eatery is also home to an on-site microbrewery that produces craft beers along with a “guest beer program” of 24 rotating taps that showcases some of the rarest and most notable suds around. Chef-owner Gabe Gordon has even designed a sophisticated system he calls the “Flux Capacitor” to dispense different beers with varying pressures and temperatures suited for each. Beer geeks hang out at the wooden bar amid industrial-chic décor of glass and polished concrete, or on the sprawling patio separated from the Promenade by a meadowy stretch of tall grasses. We recommend ordering a seasonal beer or two as part of a customized beer flight. The food hits the mark --- don’t miss duck confit tater tot casserole, skillet-baked cornbread and fried green tomatoes topped with pickled white prawns. Southern-style barbecue is dry-rubbed and slow-smoked with apple wood, almond and oak. Baby-back ribs and beef short ribs are just sticky enough and not too sweet, while pulled pork and smoked chicken are moist and tender. There’s also brisket, spicy andouille sausage and smoked seafood items like albacore. For dessert, get the pecan pie.